NEW DELHI: Canadian Prime Minister Justin Trudeau began his first full day of his week-long visit to India by taking a tour of the iconic Taj Mahal followed by a trip to an elephant conservation center in Mathura's Churmura. 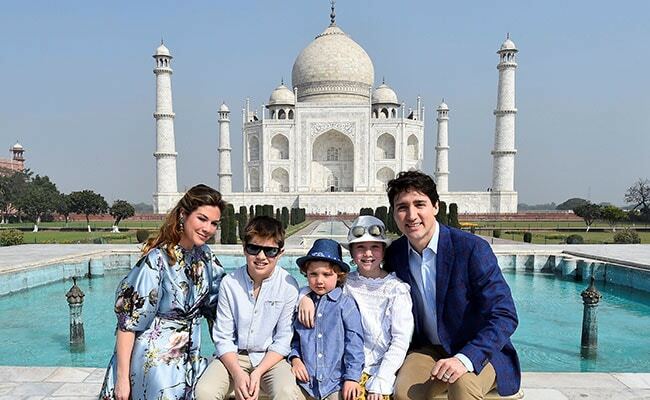 Accompanied by his wife and three children, the Trudeaus spent over an hour at the Taj Mahal on a rather hot Sunday afternoon. Justin Trudeau's daughter, Ela, donned a white hat and looked chic in sunglasses while little Hadrien enjoyed some play-time with his father. "For me to be able to be here on an official trip while bringing my kids with me to share this is really special and being able to enjoy this as a dad with my kids is really nice," Mr Trudeau said after the visit to the Taj Mahal. I was about Xav's age when I first visited the Taj Mahal almost 35 years ago... and it's amazing to be back with him & the family on Day 1 of our trip to India. Justin Trudeau's first visit to the Taj Mahal was as a child at the age of 10, he later said in a tweet. PM Trudeau left a message of gratitude, describing Taj as 'one of the most beautiful places in the world' in his entry in the visitor's log book. Mr Trudeau and family also visited the Wildlife SOS Elephant Conservation and Care Centre in Mathura. At the wildlife sanctuary, Justin Trudeau and his children, Xavier, Ella-Grace, and Hadrien pet the elephants that have been rescued and are now taken care of by the wildlife NGO. "I am showing my son Hadrien how important it is to care for our wildlife, to respect the extraordinary nature that we have around us. As cities grow and populations increase we have to make sure we are taking care of elephants and other life that have been here forever and having to adjust to a world that is changing' he said.
.@WildlifeSOS is doing important work rescuing captive Asian elephants across India, and giving them a new chance at life. Thanks for the very warm welcome at your sanctuary today. On Monday, Mr Trudeau, who is on his first state visit to India, will fly to PM Modi's home state, Gujarat. Mr Trudeau will visit the Akshardham temple in Gandhinagar and lead a discussion at the Indian Institute of Management on "Education and Investment Opportunities" with students. The Canadian Prime Minister was received by Minister of State for Agriculture Gajendra Singh Shekhawat on his arrival to India. Mr Trudeau will hold bilateral meeting with PM Modi on February 23, during which the two leaders are expected to focus on trade, defense, civil nuclear cooperation, space, tackling climate change energy and education. The two leaders are also expected to discuss India's concerns over Sikh radicalism in Canada. The issue is understood to have figured in the meeting between the National Security Advisers of the two nations held a few days ago. Mr Trudeau and his cabinet ministers, including Defence Minister Harjit Sajjan have vehemently denied there is any reason for concern.